A new change to the blog. Instead of being huffy and puffy about writing and publishing, let's take the weekend to relax and talk shop. Today is going to be a smooth transition from my usual postings, writing, to something I just enjoy doing, which is reading. I'll be sharing my experience with my newly enrolled Kindle Unlimited subscription, and I won't be using my perspective as an author and what effect it has on the industry. We're just talking reading today. And why not? If you're here about writing, you're more than likely reading as well. Reading is what we do, and presumably it's what got us interested in the whole writing ordeal in the first place. Let's start with the basics, why Kindle Unlimited? There's Scribd and Oyster in the ebook subscription model. They offer similar rates and have some more author-friendly terms. Well? It's because of ease of use. Amazon has always made it easiest for the consumer to go and get what they want with as few hoops to jump through, so I picked up a subscription. I clicked two buttons to sign up, and that was it. I had a subscription. It was a pleasant experience to enroll. 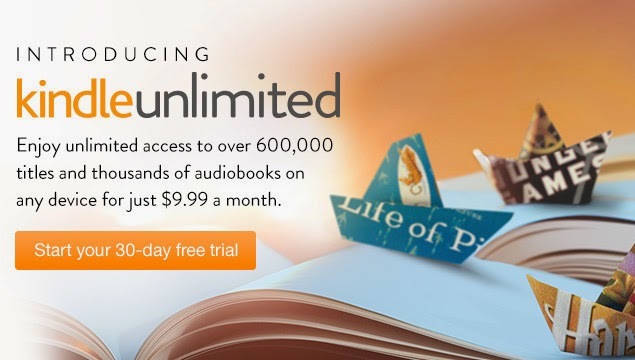 Kindle Unlimited is $9.99 which isn't much different to their competitors. What is good about this price is it's directly competitive with other subscription services, like Netflix, if you allow me a lazy example. I think subscription services are an overall good thing for consumers, because we are allowed to participate in so much more than ever before. For the average price of buying one book a month, I can read to my heart's content. Where one can binge watch the entire series of Breaking Bad, I'm looking to you Sir Anthony Hopkins, I can go through an entire book series if I so choose. That's awesome, in the surest way awesome can be used. A large amount of my backlog of books is on Kindle Unlimited as well. I feel this is a win/win for all parties involved. There are several authors' books I probably wouldn't have read because of budget-minded reasons, as I don't like to spend money on something and just leave it sitting in a corner, wasted. You're not reading this to hear my glowing praise of how much I enjoy this service, are you? You'd like to hear the pitfalls and mistakes? Me too. It's exactly how I look into services and products and see if their disadvantages way down on their potential advantages. And I have to say, Kindle Unlimited has few, from a reader's perspective, of course. The major issue I see in the future is Kindle Unlimited will be bundled with Prime, thus raising the price of Prime for all involved, and forcing people who only want one service to buy the full package. I like knowing $9.99 leaves my bank account once a month, I'm fine with that. Even though I should be fine with an up-front lump yearly payment, and enjoyment of a multitude of features for 365 days, but I'm not. It's a mental thing. Prime streaming is cheaper than Netflix, but it doesn't feel cheaper, it feels more expensive. I like feeling like I'm getting a deal, which I am. I'm reading more, more money is going to authors I wouldn't have normally read (because of good reasons and not so good ones), and it's intuitive. Kindle Unlimited is just easy to use, so I love it. I recommend Kindle Unlimited if you want to read, but because the competing services are the same, I feel it's no different to invest in Scribd or Oyster instead. It's similar to the difference of Amazon Instant Streaming, Netflix, and Hulu. There's truly little to separate them, as they all tend to receive major releases at the same time anyways, but it's all about the experience and ease of use, so Kindle Unlimited it is. I can't stress how simple it was to sign up; putting on clothes is more difficult. Now only if I had an actual Kindle, and wasn't running off this nearly five year old tablet and its fuzzy resolution, I think I would be just fine with this digital future. Oh well, back to the grind.